مقصودی فلاح, مهیار, احمدی‌گیوی, فرهنگ, محب‌الحجه, علیرضا, نصراصفهانی, محمدعلی. (1395). اثر الگوی دورپیوند شرق اطلس-غرب روسیه (EA–WR) بر وردایی کم‌بسامد وردسپهر در جنوب‌غرب آسیا. مجله ژئوفیزیک ایران, 10(3), 25-39. مهیار مقصودی فلاح; فرهنگ احمدی‌گیوی; علیرضا محب‌الحجه; محمدعلی نصراصفهانی. "اثر الگوی دورپیوند شرق اطلس-غرب روسیه (EA–WR) بر وردایی کم‌بسامد وردسپهر در جنوب‌غرب آسیا". 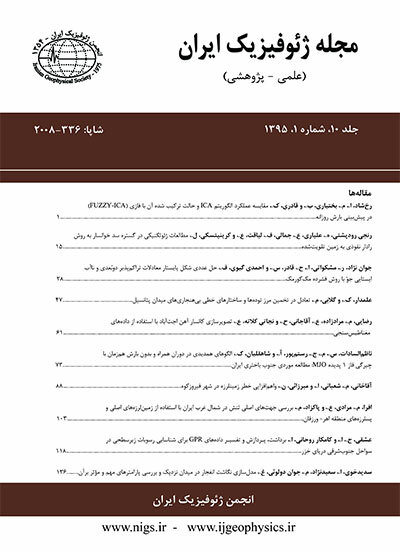 مجله ژئوفیزیک ایران, 10, 3, 1395, 25-39. مقصودی فلاح, مهیار, احمدی‌گیوی, فرهنگ, محب‌الحجه, علیرضا, نصراصفهانی, محمدعلی. (1395). 'اثر الگوی دورپیوند شرق اطلس-غرب روسیه (EA–WR) بر وردایی کم‌بسامد وردسپهر در جنوب‌غرب آسیا', مجله ژئوفیزیک ایران, 10(3), pp. 25-39. مقصودی فلاح, مهیار, احمدی‌گیوی, فرهنگ, محب‌الحجه, علیرضا, نصراصفهانی, محمدعلی. اثر الگوی دورپیوند شرق اطلس-غرب روسیه (EA–WR) بر وردایی کم‌بسامد وردسپهر در جنوب‌غرب آسیا. مجله ژئوفیزیک ایران, 1395; 10(3): 25-39. الگوی دورپیوند شرق اطلس-غرب روسیه (EA–WR) یکی از پدیده‌های جوّی کم‌بسامد است که بر اقلیم اروپا و آسیا، به‌ویژه در فصول سرد سال تأثیر می‌گذارد. در این مقاله، به بررسی اثر این الگوی موجی-مداری بر آب‌وهوای جنوب‌غرب آسیا پرداخته می‌شود. برای انجام این پژوهش، از داده‌های باز‌تحلیل NCEP/NCAR از سال 1950 تا 2012 مربوط به فصل زمستان نیمکره شمالی شامل ماه‌های دسامبر، ژانویه و فوریه و برای شاخص ماهانه EA–WR از داده‌های مرکز پیش‌بینی اقلیم (CPC) استفاده شده است. اثر دورپیوند EA–WR با استفاده از نتایج کاربست نقشه‌های ترکیبی ارائه می‌شود. با در نظر گرفتن ماه‌های بحرانی مثبت و منفی برای این دورپیوند، وضعیت میانگین کمیت‌های مهم وردسپهر برای هر کدام از ماه‌ها با دیدگاه همدیدی بررسی شده است. نتایج حاصل نشان‌دهنده اثر قابل توجه نوسانات این پدیده بر آب‌وهوای خاورمیانه، به‌ویژه ایران است. در مقایسه با فاز منفی، در فاز مثبت حضور یک ناوه ارتفاع ژئوپتانسیلی در وردسپهر میانی در خاورمیانه همراه با تقویت جریان جتی جنب‌حاره‌ای جنوب‌غرب آسیا و ترابرد مناسب رطوبت در وردسپهر زیرین زمینه مناسب‌تری را برای تکوین و اثرگذاری سامانه‌های همدیدی بر روی ایران فراهم می‌کند. The East Atlantic-West Russia (EA–WR) teleconnection pattern is one of the low-frequency atmospheric phenomena that affects Europe and Asia, especially in the cold season. In this study, the effects of EA–WR on the climate of Southwest Asia are investigated using the NCEP/NCAR reanalysis dataset from 1950 to 2012 for winter months (Dec. to Feb.) and the monthly indices taken from the Climate Prediction Center (CPC). Because of the large zonal extension of the EA–WR teleconnection pattern, all data north of 20°N are taken into account for the analysis. In this paper, the method of composite maps is employed. Considering the critical positive and negative months, the average state of the troposphere is studied for each of the two phases from the synoptic viewpoint. To this end, a month is considered to be a critical positive (negative) month, if the monthly index of EA–WR is higher (lower) than the long-term mean value of EA–WR index plus (minus) its standard deviation. In this way, among 189 winter months during the 63-year period from 1950 to 2012, 26 positive critical months and 29 negative critical months are identified. For the part of analysis based on outgoing longwave radiation for which the data is available from 1974 onwards, there exist 20 positive critical months and 18 negative critical months. The composite map analyses include 500 hPa geopotential height and its anomaly, mean sea level pressure, 300 hPa wind field, 1000-500 hPa thickness, the outgoing longwave radiation and the Eady's parameter for the growth rate of baroclinic eddies: whereis the Coriolis parameter or inertial frequency, is the buoyancy frequency, and is the magnitude of the vertical wind shear. The growth rate is evaluated and compared between the two phases at 800 hPa. In the critical positive months of EA–WR, in 500 hPa geopotential height field, there is a trough from the western part of Russia to the Middle East and a ridge over the eastern part of the North Atlantic. In critical negative months of EA–WR, however, there is a ridge over the western part of Russia, a trough over Europe and a dominantly zonal flow is observed over the Middle East. In the critical positive months, the subtropical jet stream over the southwest of Asia is stronger, and at the same time, the exit region of the polar front is extended to the border between Europe and Asia, which together with the wind field anomaly result in significant cold air advection to the northwest of Iran. Furthermore, the stronger subtropical jet over the Southwest of Asia, the southwest of Iran, and Saudi Arabia in the critical positive months is associated with increased amounts of Eady's parameter for the growth rate and thus baroclinic instability. Overall, results point to a significant effect of EA–WR on the climate of the southwest Asia. Compared with the negative phase, the presence of a mid-tropospheric trough of geopotential height as well as the upper-tropospheric wind anomaly in the form of a stronger subtropical jet stream provide a better ground for the development and organization of synoptic systems and their impact on the climate of Iran in the positive phase. The dynamical effects mentioned are also helped by a more suitable lower-tropospheric moisture transport in the positive phase. حسین­پور،ف.، 1388، بررسی بی­هنجاری آب­وهوایی زمستان 1386 از دیدگاه بزرگ‌مقیاس: پایان­نامه کارشناسی ارشد، مؤسسه ژئوفیزیک دانشگاه تهران. مقصودی فلاح، م.، محب الحجه، ع. ر. و احمدی گیوی، ف.، 1393، ارتباط دورپیوند شرق اطلس-غرب روسیه با آب­وهوای جنوب­غرب آسیا: شانزدهمین کنفرانس ژئوفیزیک ایران،23–25 اردیبهشت، تهران، 57–61. نصراصفهانی،م. ع.، محب الحجه، ع. ر. و احمدی گیوی، ف.، 1387، اثر نوسان اطلس شمالی (NAO) بر برخی کمیت­های هواشناختی وردسپهر در خاورمیانه و جنوب­غرب آسیا: مجله ژئوفیزیک ایران، 2، 51–64. Barnston, A. G., and Livezey, R. E., 1987, Classification, seasonality and persistence of low-frequency atmospheric circulation patterns: Mon. Wea. Rev., 115, 1083–1126. winter: Int. J. Climatol., 28, 139–158. Hasanean, H. M., 2004, Wintertime surface temperature in Egypt in relation to the associated atmospheric circulation: Int. J. Climatol., 24, 985–999. Holton, J. R., 2004, An Introduction to Dynamic Meteorology: Elsevier Academic Press, 535 pp. Hoskins, B. J., and Valdes, P. J., 1990, On the existence of storm-tracks: J. Atmos. Sci., 47, 1854–1864. Hurrell, J. W., 1995, Decadal trends in the North Atlantic Oscillation: Regional temperatures and precipitation: Science, 269, 676‐679. Kalnay, E., Kanamitsu, M., Kistler, R., Collins, W., Deaven, D., Gandin, L., Iredell, M., Saha, S., White, G., Woollen, J., Zhu, Y., Chelliah, M., Ebisuzaki, W., Higgins, W., Janowiak, J., Mo, K. C., Repelewski, C., Wang, J., Leetmaa, A., Reynolds, R., Jenne, R., and Joseph, D., 1996, The NCEP/NCAR 40-year reanalysis project: Bull. Amer. Meteor. Soc., 77, 437–471. Krichak, S. O., and Alpert, P., 2005, Decadal trends in the East Atlantic–West Russia pattern and Mediterranean precipitation: Int. J. Climatol., 25, 183–192. Krichak, S. O., Kishcha, P., and Alpert, P., 2002, Decadal trends of main Eurasian oscillations and the Mediterranean precipitation: Theor. Appl. Climatol., 72, 209–220. Nissen K. M., Leckebusch, G. C., Pinto, J. G., Renggli, D., Ulbrich, S., and Ulbrich, U., 2010, Cyclones causing wind storms in the Mediterranean: Characteristics, trends and links to large-scale patterns: Nat. Hazards Earth Syst. Sci., 10, 1379–1391. Panagiotopoulos, F., Shahgedanova, M. and Stephenson, D. B., 2882, A review of Northern Hemisphere winter-time teleconnection patterns: J. Phys. IV., 12, 27–47. Peixoto, P. J., 2007, Physics of Climate: Springer, 564 pp. Xie, P., and Arkin, P. A., 1998, Global monthly precipitation estimates from satellite observed outgoing longwave radiation: J. Climate., 11, 137–164. Wallace, J. M., 1983, The climatological mean stationary waves: Observational evidence: in Large-scale Dynamical Processes in the Atmosphere, eds. Hoskins, B. J., and Pearce, R. P., Academic Press, 397 pp.